Sorely miffed because he was not there, yet equally amazed to appreciate that he was not alone, Iain Robertson was among a few hundred people that viewed the London-based launch of the new Jaguar XE on-line. There has been a general rule of thumb, which was introduced around mid-2009, around a year after the UK and world economies crashed to disastrous lows (because it took the extra time for the car companies to spend their formerly immense marketing and promotions’ budgets). Working to a premise of ‘if-we-don’t-spend-it-now-we’ll-not-get-it-again’, slowing the sometimes ridiculously over-squandering leviathan of a few years ago, to enable an about-turn, proved difficult. Yet, somehow, the task was carried out. Gone were the extravagant overnighters in myriad ‘Hotels of the World’. Concorde was already off the cards, since Blair, BA and various cronies had grounded it. Gone were the high-value ‘freebies’, the sole aim of distribution of which was to ‘bribe’ the scribe into scrawling supportive editorials. Also diminished in number were the expensive, private charter flights from the likes of Stansted, Farnborough and Birmingham Airports. The UK and European motor industries had drawn-in their horns. Budgets had been slashed. Yet, the ‘depression’ that had struck ubiquitously also had a most negative effect on the printed word. Newspaper sales (not helped by abysmal management decisions) plummeted. Magazine sales followed suit. Luxuries became a simple housekeeping deficit. They were no longer required. Titles disappeared every week in the intervening period. attends as guests of Jaguar at the global reveal of the new XE in London at Earls Court on September 8, 2014 in London, England. Kaiser Chiefs with the new Jaguar XE at its reveal in London, Monday 8th September 2014. In many ways, that was to the advantage of the marketing and PR departments within the various car companies. They would have fewer people to deal with. The cost-per-launch would reduce significantly, when just 30, instead of 130, motoring writers could be allowed the glimpse into that firm’s future. There has been huge fall out, on both sides of the equation. However, despite the ‘good news’ stories that the UK government’s spin machine was desperate to create and perpetrate, not all was well. Retail sales sank to new lows. Company car operators were hanging onto ageing vehicle fleets, because they did not have the funds available to invest in fresh transport. The market was not in a tail-spin but it had frozen. However, emerging like a phoenix from the fires of desperation rose the Great British Saviour of the motor industry…JLR. Also known as Jaguar-Land-Rover, the Coventry and West Midlands-based conglomerate had been sold by Ford Motor Company to an industrial combine from the Indian sub-continent that was headed by Tata, a steel and automotive manufacturer. The £1.15bn deal was struck in early-2008, just before the British House of Cards tumbled. The government needed to crow about something and there was little denying of the vitality of Land Rover, which seemed to defy gravity in its upwards trajectory. However, Jaguar was a different kettle of fish altogether. Historically, this car company had always struggled to make money and to make the numbers. Hysterically, it was inextricably linked to Land Rover and the funds from the successful relative would clearly aid the failing one, even though it was a tricky gamble to pull off. Jaguar has always wanted to play with the ‘big boys’. It has always perceived itself as a British match for Bavarian BMW, Ingolstadt’s Audi, or even Stuttgart’s mighty Mercedes. Yet, it had to make the transition from relatively affordable luxury, to high-end rivalry. The problem was, it could not do it. The success of both Merc S-Class and BMW 7-Series in the luxury sector would preclude it, for reasons that were more than blindingly obvious. Even the latest XJ saloon range was not merely ill-judged but also ill-styled. It looked little better than a Ford Granada Scorpio of two decades ago…as ugly as sin itself. Even a long-wheelbase version, aimed at tempting the lounging executive, would fail thanks to a lack of width and generally poor packaging. The Teutonic rivals were large and accommodating and no less nimble, even though sporting intent was hardly a pre-requisite (Jaguar clearly believed it to be). Today, you can step into almost any Jaguar showroom around the UK to demand and obtain a £20-£30,000 discount from the list price of an XJ. Is that a ‘success story’? Nope. Attempting to wrest large car sales from the Germans is not even feasible with the XF range, recent estate car, or not. Believe me, it is the best car in the firm’s range but it has started to be priced out of contention, besides, it cannot really carry off the premium aspiration of its perceived competitors. The XK Coupe and Convertible, now having ceased production, were the genuine good-lookers in Jag’s firmament. However, the F-Type is not merely over-priced but has not been the big-seller that Jaguar hoped it might be. So, to the XE. On a fateful London night, at an international event held at London’s Earl’s Court and on the River Thames, the XE received its reveal in a stage show spectacular that looked more end-of-term High School Musical than a proper, professional product reveal. Okay. I know that the Germans might have had twirling dervishes and acrobats in outlandish costumes for their equivalent events (they lack our irony) but to wheel-out John Hannah, Scottish star of ‘Four Weddings and a Funeral’, in an historical 90-minute romp through Jaguar’s history, complete with a cast of dancers, both balletic and other, accompanied by a third rate theatrical performance working with an exceptionally stilted script, was pushing the project to extremes of pain never felt before. Scottish singist, Emile Sande, sang her socks off Thames-side, while the Leeds pop combo, Kaiser Chiefs, did the on-stage bit at Earl’s Court. The inevitable interviews with the stars provided the inevitable saccharin-sweet vox-pops, in which both pop group and artiste were clearly ‘so much in love’ with the ‘exciting new Jagwar’ that they might only be a whisker away from receiving an example (each) with their hopefully sizeable pay cheques. The inestimable lovely Ginny Buckley anchored the event at Earl’s Court, aided and abetted by an arm-swinging and clearly drug-induced Irishwoman, who has performed similar duties on some ‘jungle-based’ TV programme in the past. To say that the interviews were as stilted as the overall performance would be an understatement. Each Q & A had been clearly rehearsed to the point where the rictus grins on successive executives’ faces were in danger of securing their delight for the rest of their lives. The actual, Union Jack-flying, cliché British programme occupied around 150 minutes of interminable tedium that was so much ‘grander’ than the car itself. Talking of which, vaunted as a potential new style icon, all that I could see was a tired regurgitation of a styling stance that has been at Jaguar for the past fifteen years at least. It lacks heritage. It lacks punch. It lacks a future. It looks too much like the XF. Unlike the original XJ6, which was uniquely iconic in the late-1960s, or the Mark Two that preceded it, the ‘enticing’ and ‘enthralling’ new XE seems to possess neither character, nor charisma. Preening it with a massive marketing spend that kind of misses the point and serves to satisfy the marketers but not the audience is a bit ‘old hat’ and sad really. 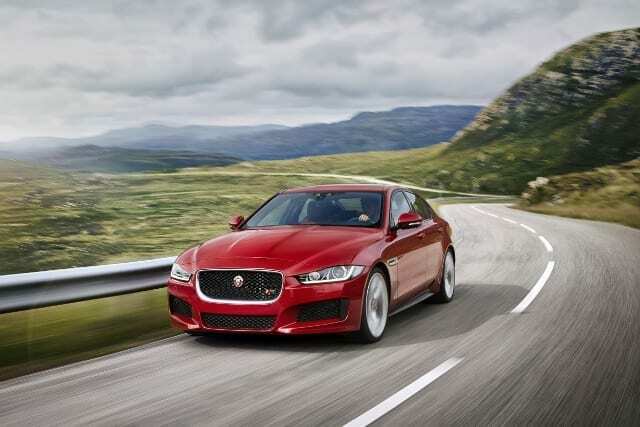 Can the XE be a real contender in the class? Truth is, I would love it to be so. Unfortunately, it is merely following and not grabbing the lead of the sector. I would suggest that the Teutonic trio (Audi, BMW and Merc) will be intrigued by it but will not feel in the least bit threatened. Jaguar Cars, in the meantime, needs to ponder judiciously about its future survival, because it could be in jeopardy, if sales do not take a marked upswing.